After being on a plane for 19 hours this was a retreat from heaven. The condo was immaculate and just as beautiful as the pictures. I can't say enough good about the unit. Parking is below and about 25.00 a day. Within walking distance of everything. The view is stunning and breath taking. You can not go wrong staying here. Should we visit again we will definitely stay here. Condo layout was amazing, spacious, lots of clset space, and updated appliances. Condo was very clean, and host provided extra towels, linens, and evev beach accessories. View was amazing, with a short 5 min walk to beach. Great condo with an amazing view, especially of the fireworks. It was just like the pictures. Easy access the beach and restaurants. We had one small issue, the coffee maker did not work, I emailed about the problem and it was replaced the same day, thank you. Great little pub downstairs called The Harbor that does excellent pizza! This place had everything and more than I was expecting, great location, great price and a super awesome view. My friends and I felt like we didn't want to get out of there just to stay and enjoy the view. 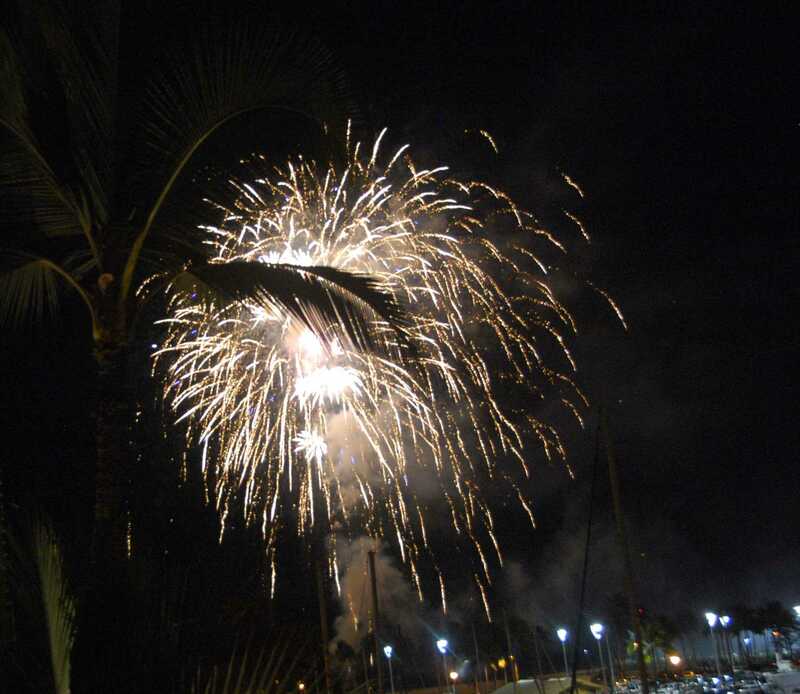 On Friday night we watch the fireworks show from the lanai. Overall, great!! I will totally be staying here again. Spectacular views were exactly as shown in the pictures. Very convenient access to touristy activities most include free pick up at near by Ilikai Hotel. Bus access is very close. We did have a minor issue of the AC not working right when we first got there, but a quick call later it was immediately resolved and all was well. Tia was very responsive! Our family of 3 came to Oahu for a surf contest at Ala Moana bay . Ilikai Marina was perfect for us. Beautiful apartment amazing views, very clean , beautiful kitchen, very nice modern style, nice bathtub! We love it we can't wait until next surf contest to be back ! We spent a week on Oahu. Absolutely wonderful. The condo is fantastic. Very clean updated. We were so happy we booked two weeks in the fall! 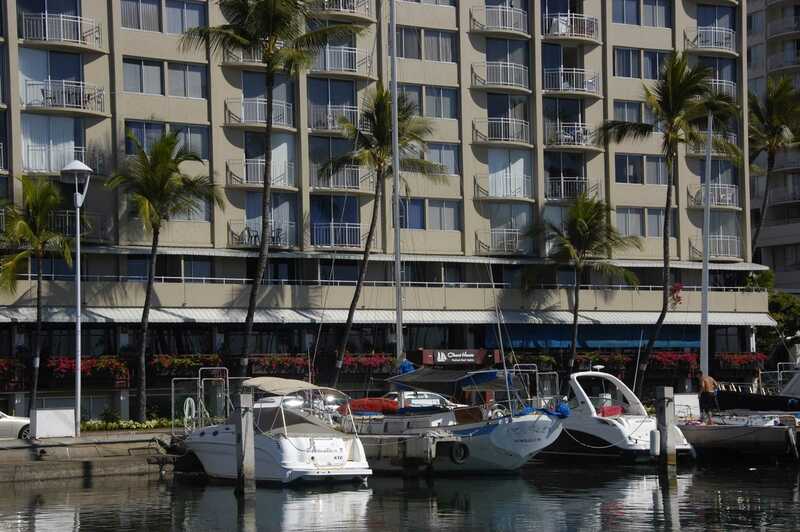 We have just returned home after spending three wonderful weeks staying in the Ilikai Marina condo 1792. We felt totally at home as the condo is well furnished with everything you need and the pictures on the website are exactly as shown - we had not thought it could be as lovely as it is. The view from the 17th floor is amazing and so relaxing, and the Friday night fireworks were greatly enjoyed. We have stayed in a number of properties in Hawaii over the years, and this was by far the cleanest we have ever seen. We would be happy to return here the next time we are in Honolulu. My wife and I stayed here for a week. The location easily walk-able to Ala Moana shopping center as well as Sam's club and Walmart. Downtown Waikiki is a bit farther but easily done. The parking garage cost $161.00 for a week. The parking garage is easy to use and very convenient. We didn't really use the kitchen much but it has everything that you would need to cook. There are no condiments at all so be prepared to buy everything you will need. There weren't even any coffee filters. The view is great and nicer than the pictures show. This was our second stay at this apartment. This location and the apartment were perfect for all of our needs. The view is stunning. I slept on the pull-out lounge. It is my only complaint about the lounge as it is terribly uncomfortable to sleep on. HVP looked after two small problems quickly and efficiently. We will be back! I cannot recommend this accommodation highly enough. The room was spotless, and had everything you could possibly need. Great views and close to everything. Will definitely be staying there again next year! Mahalo!!! 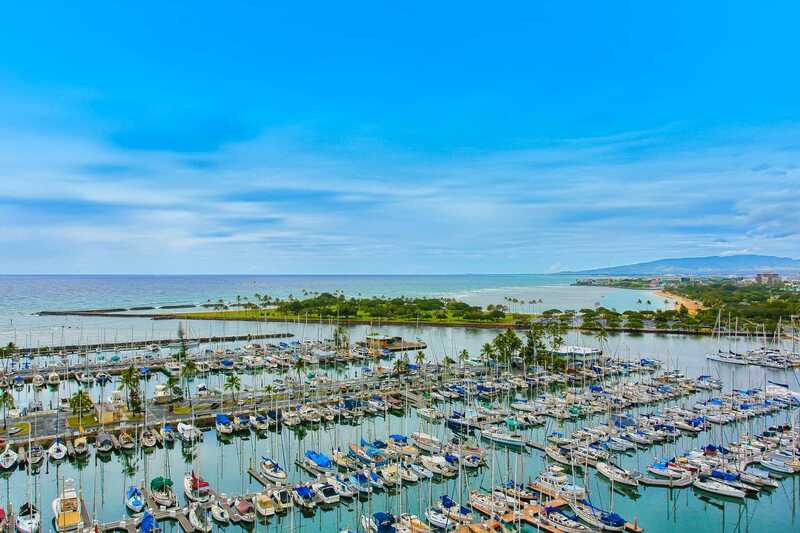 This condo is really well located to provide a nearly 180 degree view of the marina, the ocean, the lagoon to the left, and Honolulu high rises to the right. In addition to the 5-star view, the condo was tastefully remodeled, and is well equipped with everything we needed for our stay. We like the layout of this unit compared to others at the Ilikai, with 2 doors that lead to the bathroom, and the "extra" mirror/counter area outside of the bathroom. It's very close to the garbage chute at the end of the hall, which is very convenient! (and no, there's no noise issue from that at all). Being on the 17th floor, you're pretty well insulated from street noise. The minuses are relatively minor. As someone mentioned, the sliding glass door needs to be replaced at some point. The balcony is SRO (standing room only). 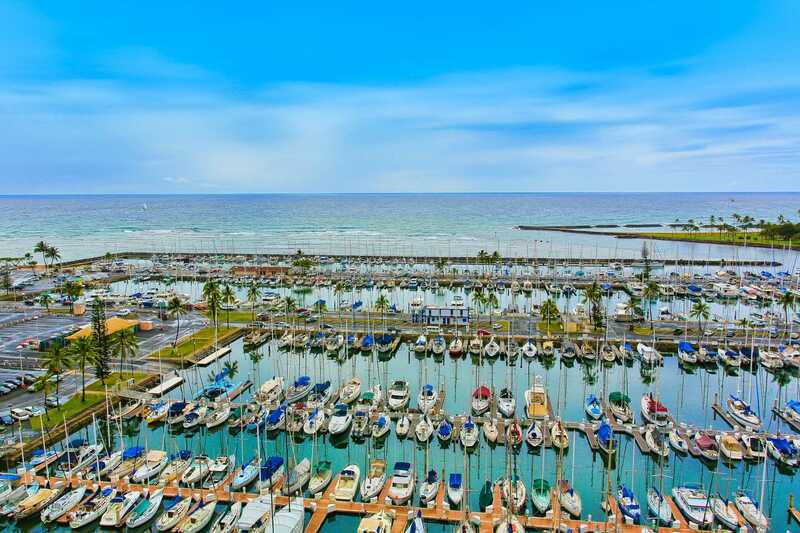 The Ilikai Marina suffers a bit by comparison with the Ilikai Hotel, which has some amenities, like a nice lobby, a restaurant, 2 swimming pools, and it's a little shorter walk to the beach. But, you won't get nearly as good of a view as you get from 1792, or as much privacy. And it might be difficult to find everything that we liked about this condo at the hotel - like a bathtub, or the mirror/counter area. All in all, we really enjoyed staying at this wonderful 17th floor condo. Enjoyable view, very clean and organized. Looks and feels new. Will be back again! This was our 1st stay in 1792 and we had a very pleasant time here. The view was unbeatable and the condo is roomy and clean. perfect location close to everywhere but away from the noisiness. The only thing I dislike about is the wi-fi internet set up. We needed to call someone in the middle of the night to fix this. otherwise our stay at 1792 was perfect! The WIFI provider does have 24/7 support for Guests who occasionally have difficulty connecting their devices. Excellent location and the view is super. We spent 10 wonderful days. I highly recommend staying at the ILikai. We stayed for 10 days in Honolulu. The condo was very clean and completely furnished with everything we could possibly of needed. It was a great location since we didn't want to be in the middle of Waikiki Beach so it was great being on the end. We were able to see the Hilton fireworks show perfectly! I would of rather had a regular couch to sit on the futon isn't that comfy but the bed and everything else was wonderful. Mahalo it was great! We were here for six nights. We enjoyed the view and the sunsets. We didn't really use the balcony much because it was narrow. Great location. We walked back from Diamond Head. Shopping just a short walk down the road. Everything we needed was there and it was very clean and tidy. We had an inquiry and had very quick response. The only thing we didn't like was the futon. We find them very uncomfortable to sit on. Otherwise everything was great. This was the third condo rental we've tried via VRBO and this was by far our best experience. 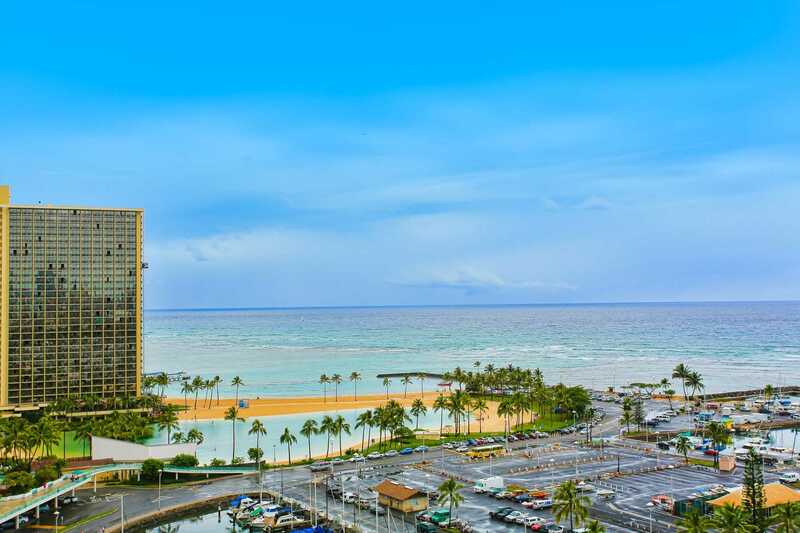 The condo was located in the heart of Waikiki and in easy walking distance to other attractions like Ala Moana shopping center, Honolulu Zoo, etc. We stayed a week while we attended our niece's wedding. The condo was super clean, very well equipped (from kitchen utensils to beach chairs). The building is secure with on-site security. The unit was quiet. The only thing I might suggest is replacing the futon with a regular couch; although we weren't in the room that much, the futon isn't all that comfortable when watching TV. The view out over the marina and into the ocean was gorgeous. Also, the building has a secure parking garage attached and since we had a car that was a plus. The parking is extra ($20/day) but well worth the convenience. Also, the internet worked well. Overall, our experience was super positive and we'll probably look to rent this unit again when we return to Waikiki next year. Great location, clean with a very nice kitchen. 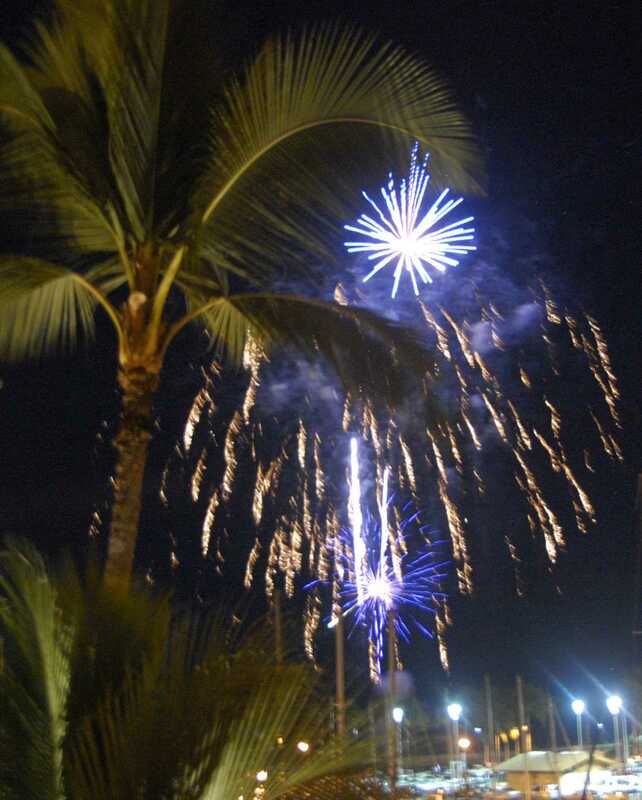 Outstanding view of the Marina and Ocean - The Friday night fireworks are right outside the window. Check it was very easy. One downside was parking. There is no monthly parking if you arrive after the 6th of the month and the parking procedure is not well explained in the check in process. When you arrive you take a ticket and proceed thru the gate and park where ever you would like. When you leave - do not put your ticket into the machine the first time, but hand it to the attendant and they will charge you $20 a day for as many days as you are staying. After that, the same parking ticket will act as a pass for coming and going. If you put the ticket in the machine first - then they will have to charge you the hourly rate. Best thing is to talk to the attendants before you enter the first time to make sure you understand everything. The air conditioning was marginal. The cable TV package was bare bones and didn't get FOX NEWS. All in all, it was a good value and a pleasant stay and we would stay there again. RESPONSE: We are glad you enjoyed the condo. OUR PARKING INSTRUCTIONS: "Enter the parking garage on your right (driveway on Hobron Lane) just past the Red Lobster restaurant. Stop at the Attendant's booth and pay for 24 hour self parking." The building did temporarily have 1 of several Central AC chillers down. The replacement was sent by air and installed ASAP. 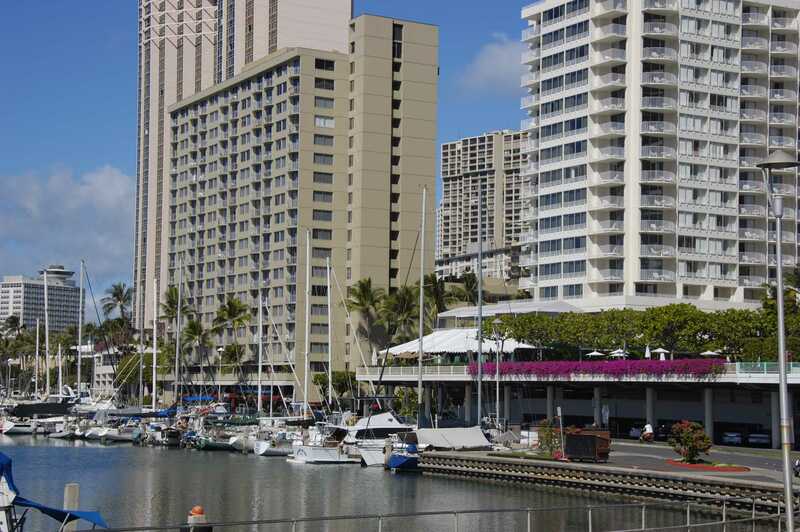 This condo is a great location with a great view over the marina and the ocean. Also close to the bus, restaurants and shopping. It was well equipped and we loved the king bed. The staff at Hawaii Vacation properties were very helpful in finding us a second location when we wanted to arrive 5 days early and also helped us move from one condo to another. The only problem we had was with the shower. As it had a sliding glass door along the tub, the opening was very narrow. The narrow opening, with the sharp metal track, made access to the tub and shower very difficult for a senior. That, along with no grab bar inside, is a disaster waiting to happen and made us very uneasy each time we used it. With so few people actually using a tub these days, a walk-in shower would make more sense. Other than that, we loved the condo and our stay there. I can not begin to say how much we enjoyed staying in IIikai Marina 1792. I was hesitant to rent a condo from pictures on line, but the constant contact from the agent and assured everything would be OK. From the moment I opened the door I was at home. The upscale newly remodeled condo was great. It was clean, and had everything we needed to make our stay comfortable. The view was fabulous. The separation of the bedroom and living area was perfect.Many places and restaurants were within walking distance. Shopping was very close. I will never stay in a hotel again. Thanks for the time of our life in Paradise ! A great place to get away from our winter. The unit was modern, with everything one would require. Great views.A couple of suggestions. The intake air conditioning intake grills badly in need of cleaning, for better efficiency. The sheets were too small to fit the bed size. Otherwise the unit couldn"t be faulted. Many thanks for allowing us to use your condo. The king bed is made up with king sheets for Guest arrivals. We provide queen sheets for the sofa sleeper. We are always available by phone if there are questions during a stay. Such a beautiful apartment, the views were awesome. We had a wonderful stay, the location was perfect. The kitchen, dining and lounge areas were all as seen on the website. The bedroom was very comfortable with many drawers and wardrobes and good airconditioning. Lots of beach things was a bonus and the kitchen had more than what we needed as a couple. 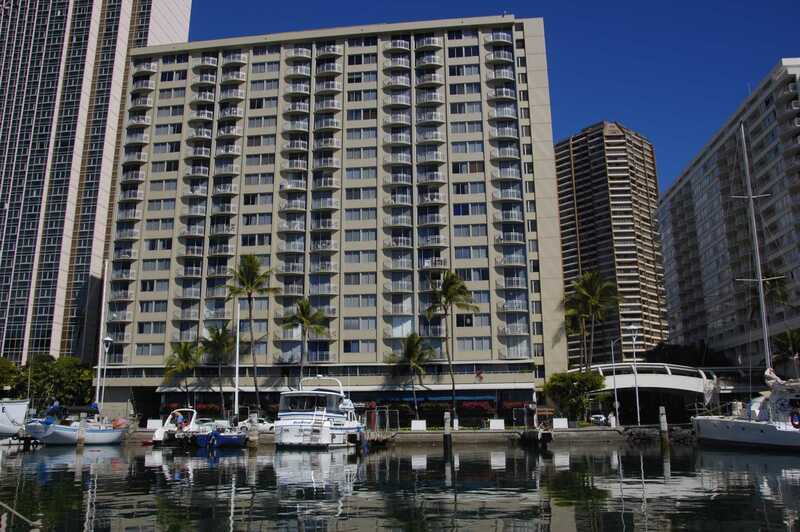 We are keen to return to Waikiki so Condo 1792 will be our first preference, lovely holiday, lovely environment, heaps of space with the balcony available when a little cooler in the late afternoons, and all morning. Sunshine all day in this Condo with spectacular views day and night. Thanks heaps Hawaii Vacations, no hassles whatsoever. Well done. What a beautiful property. The view is awesome. We had a wonderful stay in this condo. It felt like home. The location is perfect. Its been recently upgraded with a high quality granite kitchen and and new bathroom. The bed is soft and comfortable and the aircon works well. Lots of equipment for the beach and the kitchen is well stocked. The Netflix on TV was a much appreciated bonus. We will be requesting this condo again. Thanks to Hawaii Vacation properties for a hassel free reservation and support while we stayed here. A well run organisation. condo was very nice, although it would be nice to have a couple of lawn chairs on the very tiny lanai. Nicely furnished and very clean. From the moment that we walked in, we loved our stay at the Ilikai Marina. The condo was bigger than it appeared in the photos and the view was simply wonderful! It was clean, modern, really nicely appointed and very comfortable. It is only a short stroll to beaches and shopping, yet very quiet at night. We loved the convenience of being able to make simple meals in the kitchen - although the kitchen is so well appointed that you could host a dinner party, if you wanted. Also, the keyless entry is great - you don't need to worry about losing keys at the beach. If we are lucky enough to get back to Hawaii, we would certainly stay here again. Arrival at Ilikai Marina 1792 was a welcome surprise. The condo was immaculate and looked brand new. Decor was excellent. The views over the Marina, Ocean and Lagoon were magic morning to night. Perfect location for access to everything... the beach, shops, walks and transport. Management agent was helpful and organised everything beautifully. Mahalo!